Three spear points that might have been used to attack a woolly mammoth during the last ice age now rest behind a glass casing in the Confederate and Native American Museum at Janney Furnace. The artifacts, called Clovis spear points, are only part of a much larger collection of American Indian artifacts the museum received from a private donor last week. William A. Sims, an orthopedic surgeon in Decatur, donated between 700 and 1,000 items to the museum. Sims and his father, the late William Finley Sims, began collecting the items in the 1930s from farm land and creek banks in southeastern Tennessee during the 1930s. 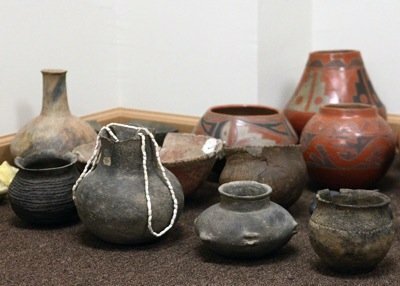 By the time he handed the collection over to the museum it included hundreds of arrowheads, several pieces of pottery, ceremonial pendants, rolling pins, grinding stones and several miscellaneous items. The Clovis arrowheads are the earliest spear points found in North America. The Clovis points look like flint domes with sharp points at the tip, making them distinctly different from later arrowheads, which are often triangular in shape, said archeologist Harry Holstein, a professor at Jacksonville State University. Archeologists believe the Clovis points were used by the earliest American Indians, a group called Paleo-Indians. Clovis points have been found embedded in the remains of woolly mammoths, mastodons and giant bison. According to Holstein, people of the Paleo-Indian period would have speared the animals in the belly and approached them to pull the spear heads from the animals’ bodies. “Talk about brave guys,” Holstein said. Sims found one of the Clovis heads himself, at a cave entrance. He still looks for and finds artifacts today in the northern part of the state. Museum curator Tim Moon and about a dozen volunteers went to retrieve the items from Sims late last week. Using cardboard boxes, bubble wrap and newspaper, they packaged the items and brought them back to Ohatchee on two trailers. Moon and 12-year-old Kory Sparks, a local pre-teen with an interest in museum work, have been unpacking and sorting the items ever since. Unpacked boxes, tables full of arrowheads, axe heads and pieces of artifacts litter the museum's back room. Moon and Sparks are in the earliest phase of sorting and cleaning the items, some of which have not been cleaned since they were placed in Sims’ father’s collection in the 1930s. Once the pair is finished unpacking, sorting and cleaning the items, they’ll be placed in wood-framed glass cases. The collection makes up about one-third of the museums’ Indian artifact collection, Moon said. Resting in rows on a black folding table in the back room are more than a dozen axe heads. Moon said they were likely connected to wood handles by strings of raw hides. Their once-sharp edges are now rounded and worn. Not far away, hundreds of arrowheads that range in color from charcoal grey to Alabama clay red are lined up on the tops of glass cases. In a corner rest more than a dozen cracked clay pots, some of them holding beaded necklaces Moon believes to be more than 1,000 years old. Eventually they’ll be placed behind glass and kept in the back room where the schoolchildren and visitors who frequent the museum are likely to see the items. Holstein, who conducts archeological digs in search of American Indian artifacts, said he’s glad to know that the collection is being held in a public museum.